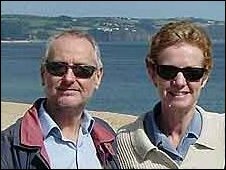 The family of a British couple kidnapped by pirates have made another appeal for their release after seeing footage of them surrounded by gunmen. In a video obtained by Channel 4 News, Paul and Rachel Chandler, aged 59 and 55 and from Kent, are seen surrounded by Somali gunmen. Mr Chandler pleads for their lives, saying they fear they may be killed within a week. The pirates have demanded a ransom of $7m (£4.3m) in a phone call to the BBC. This is nearly double the highest ever payout to Somali pirates. With a gun pointing at her head, Mrs Cahndler said: "Our captors are very impatient now that nobody has been in touch to enter into negotiations. "So we ask the government and the people of Britain and our family, to do whatever they can to enter into negotiations with these people to buy back our lives." BBC Security Correspondent Frank Gardner said the family were believed to be bearing up well. "Although it came as a relief to see their loved ones alive and unharmed, it was distressing to see them surrounded by Somali gunmen," he said. And a statement released by the family said: "We miss them deeply and urge their release." After the footage was aired, the Foreign Office issued a statement expressing sympathy for the victims' families, but reiterating its position. A spokesman said: "The UK government position is clear: we do not make substantive concessions to hostage takers, including ransoms." Instead they are using all their connections in east Africa to try to shift "perception away from cash machines" and to try to persuade the pirates to do the "humanitarian thing and let them go", said Mr Gardner. He added that although Somali pirates were very good at putting psychological pressure on, they had never killed anyone themselves. There are fears that the pirates could sell the couple on to Al-Shabaab, an Islamist group in Somalia, if their demands are not met. Mrs Chandler said: "We are told that there is a terrorist cell, or a fanatic cell, searching for us and we are also feeling very much under threat now that these people themselves won't hesitate to take our lives." 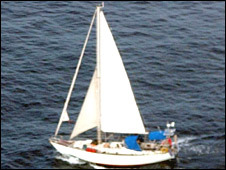 The Chandlers, of Tunbridge Wells, were taken hostage on October 23 as they sailed their yacht in the Indian Ocean.